Candi Singosari (or Candi Singhasari), located 12 km north of Malang (East Java) was built in the memory of the last king of the Singhasari kingdom (1222-1292), King Kertanegara, who was assassinated in 1292. The temple complex of Singosari was probably made of seven or nine temples, only one of which remains today, and was never finished due to the death of the king. A stone inscription from 1351 is dedicated to the priests who died with the king. It is thought to be one of the places where the ashes of the king are deposited. Candi Singosari is dedicated to the Hindu God Shiva, and was most probably consecrated as a state temple by the following Majapahit dynasty, where the last king and glorious ancestor would have been revered as a reincarnation of Lord Shiva. Most of the rooms usually containing deities are empty, with the exception of one on the first level, adorned with a representation of Agastya, the supreme teacher who taught Shiva. 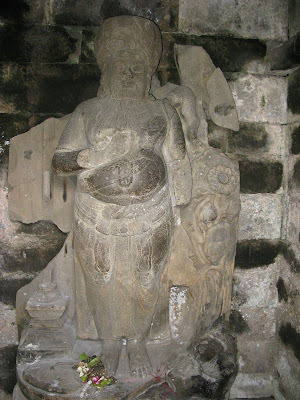 As a sage, Agastya is represented with a beard and a big belly symbolizing knowledge. Legend has it that Agastya, who was an Indian Brahmin, was not allowed to cross water due to his caste duties, and had to swallow the ocean to bring Hinduism to Indonesia. The lotus flower on the left side of Agastya is a distinctive stylistic element of the Singosari and later Majapahit kingdoms. Unfinished kala heads on Candi Singosari. The completion level suggests that work was carried out from top to bottom.